There are typically four types of rosters to build 1. Raiding (attack) 2. Raiding (defense) 3. Missions (walkers) 4. Missions (survivors). This raiding Guide will address raid rosters specifically. We will follow-up this post with a Mission roster guide for The Walking Dead: Road to Survival in the near future. The goal to a successful raid is to start with a strong opener. You’ll want to take out at least one opponent, preferably two before the defense starts with their first attack. To succeed in this you’ll need two strong players with the same trait to attack a weaker target and weaker trait. Lately we’ve been seeing a lot of tough/blue characters defending, so we have been building line-ups around Tyreese and Glenn. If your opening two attacks are successful, you will have killed a target, leaving three more characters to try and take out a second target. If the target does not drop, you should use a third character to finish off your initial target. 1 target down, 3 attacks remaining – Look to take out a second target. You should aim for traits that counter your openers (i.e. Using Tyreese and Glenn look to take out any strong/green targets). If you are able to take out a second player by the end of your first turn, you have all but won. 1 target down, 2 attacks remaining – At this point it is highly unlikely, that you will be able to burst down a second target. At this point you should spread out your attacks and target relative weaker traits with my remaining characters. The goal here is to set up your second round of attacks, so that you can take out 2 players leaving you with just 2 targets remaining. Select a leader that provides +crit and +attack bonuses. Select weapons that add +crit +attackk and bonus AP when attacking. Since you are using traits and selecting targets focus on +attack and AP bonuses as they are more reliable and consistent than +crit. To succeed in Raiding at The Walking Dead: Road to Survival you’ll need two strong players with the same trait to attack a weaker target and weaker trait. Selecting a successful raid defense is a little bit tougher. You don’t get to select who to attack and you don’t get to adjust your team. Our suggestion is as follows: Select 1 of each trait for your team. Do not duplicate your leader’s trait. Additionally look to have one player with a healing or defense rush. When selecting your team look for high defense and high health players. Select a leader that offers bonus defense or +hp. Lastly look for +crit weapons. The goal here is to be able to absorb enough damage to pop off a few AR skills and pray to the RNG that your crits pop off. Since you are auto attacking on defense, the decision as to who your characters attack is decided at the beginning of the turn. There is no setting up or planning. They will look to hit weaker traits first and then as far as we can see, they will randomly attack targets and don’t try to focus down individuals. If you can string together a few crits and survive the first two rounds losing no more than 2 players, you’ll find yourself in a good situation to pull out the win. Select weapons that add +crit +defense and bonus AP when being attacked. Select a leader that provides +hp, +defense and +crit bonuses. Stringing together crits is important, since you cannot readily rely on attack power due to auto attacks. 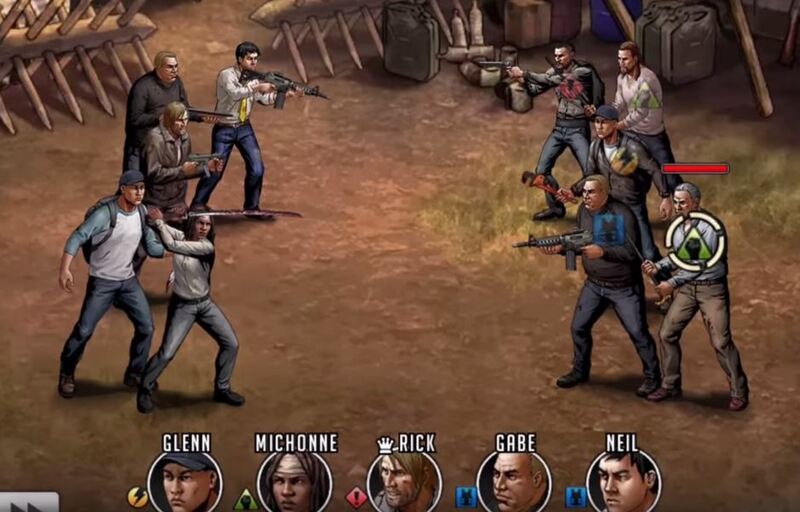 We hope this helps you out while Raiding in The Walking Dead: Road to Survival. If you have additional tips and tricks for raiding and you think they should be added to this guide, feel free to leave a comment below.